Beech Chalet is a mountain chalet as you would imagine them to be. Set in the grounds to the rear of Clachaig Inn, these timber clad chalets are the perfect mountain retreat, with excellent accommodation and unrivalled mountain views. Comfortable chalet, great view, very quiet. We took advantage of the convenient access to super pub food and well curated drinks. Lots to do in the surrounding area. Our kids really enjoyed the largely phone-free holiday, we played games and spent time together from ice climbing to walks to simple pleasure of stone skimming. Dear Peter, Thank you for your great review. We are glad you and your family enjoyed their time in Beech Chalet. Hopefully we will see you back again soon. The Clachaig Inn and chalets were almost perfect. Location, bars, food, chalet facilities were superb. Chalet itself a little dated. Our initial booking was for a room in the Lodge, but due to refurbishment, we were moved to the Beech Chalet, which was excellent - a superb place to relax after a hard day on the mountains. Beech Chalet is positioned in a beautiful part of Glencoe looking out on the glen through woodland and streams. The chalet itself is very clean,warm and comfortable with everything one needs for the perfect self catering experience. The staff at the hotel are delightful and the Boots Bar great fun to visit with excellent ales and whiskies and plenty of opportunity to taste before you buy. We have been coming here for many years now and have never had anything other than a most pleasant stay. We feel so happy and refreshed after a week at this beautiful place and look forward very much to our next visit. Thank you to all the wonderful team. Out 3rd visit to beech chalet and it gets better every time. The Clachaig just seems to get better. Many thanks to Joanne and Ann Marie for the chats regarding my late wife. See you next year - already booked. We thoroughly enjoyed our stay - already looking to book again next year. Views from balcony changed every day with the beautiful Glencoe mountains. Had everything we needed and our dog was also very comfortable and relaxed in the chalet as plenty of room in living spaces. Food and drinks in Clachaig pub excellent- although gets very busy. We had an amazing stay here , we used it as our base for traveling around the west of Scotland, chalets were perfect and scenery was overwhelming! We booked for a week at Clachaig in the Beech chalet with my other half and her parents. It acted as a great hub to our various trips around the highlands providing facilities for us to comfortably cook ourselves if we fancied it, or defer to the excellent bar and kitchen at Clachaig's pub (which we did a few times!). The Boots bar hosted a Celtic band on our first night, which was a great way to start to trip and get into the swing of things. The staff were helpful, the food & drink excellent and the Chalet was spacious (for 4 adults) and well equipped. Thank you very much for your review. Glad to hear you enjoyed your stay and our bars. Excellent accommodation for a great week’s walking. Superb setting with great views. The pub is welcoming with good food and wide choice of beers. Warm welcome at the start although surprised by the emphasis on dog rules. Can only suppose there have been poor dog owners to stay in the past. Chalet with everything we needed. Fantastic picture window views and clear hot weather made the area even more beautiful. We have never seen Glencoe look so benign! There is usually a haunted feel to the area, but this week the sun shone all the time. We enjoyed wonderful walks and the dog enjoyed keeping clean in the unpolluted mountain streams. 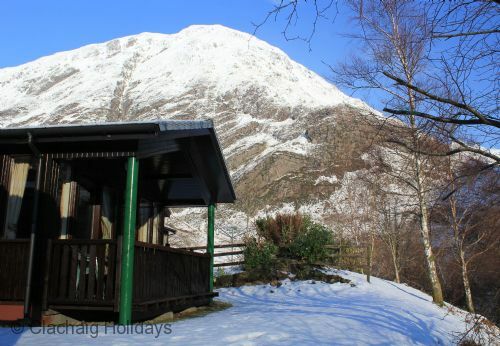 The chalet is perfectly located for a walking holiday in Glencoe with all the mountains close by. Spacious and comfortable and conveniently close enough to the Clachaig Inn for food and refreshments! Friendly and helpful staff made our stay a joy. Always a pleasure to return to the Clachaig. Spectacular venue at any time of year! During 50 years of married life with many self-catering holidays, Beech Chalet must rank as the most memorable. Whilst this is obviously an ideal location for walkers and climbers, as senior citizens, we still enjoyed a regular local wander, very contented to look at the magnificent scenery all around us. We much enjoyed our early morning encounter with the deer at our verandah. As a real ale enthusiast, the on-site access of a wide range of beers together with good food - without requiring the car - was an added bonus! We are certainly hoping to return. Wow! Quite a review. Glad you enjoyed your stay so much. We look forward to welcoming you back again soon. will be booking again early to ensure we stay in the chalets again as we enjoy being so close to the pub as well. I would like to give a special mention to housekeeping the chalet was a joy to walk in to after a long journey beautiful, clean and warm. Good to hear you had a great stay. Thanks for the mention for housekeeping. They work very hard and their efforts are easily overlooked. See you next time. Excellent holiday, great place and superb surroundings. Plenty to do with breath taking scenery. Clachaig Inn is a great place to relax with friendly staff, especially the "Boots Bar" which had a good range of beers and real ales on tap along with the arranged activities during "February Fest". Look forward to returning for another enjoyable holiday. We used this chalet as "base camp" for our winter climbing expedition. It was perfect for the 2 of us with enough space to be private, including 2 separate bathrooms, and a good deal of space and heated areas to hang our wet clothes! Location spot on (for access to the Ben and obviously Glen Coe) and ideally situated at the end of the Aonach Eagach ridge. A truly beautiful place to stay! The chalet was warm, cozy and comfortable with fabulous views. Magical in the snow!! Beware though, if you're going at Christmas you need to be well-stocked with the hotel and bar being on closedown. Glad to hear you enjoyed your stay. The snow this year certainly added a little something extra!